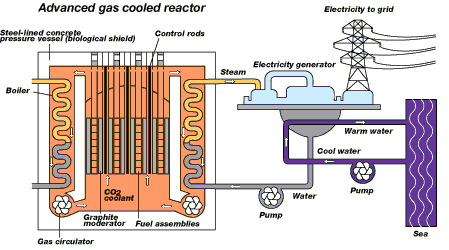 There are various iterations on this concept, most notably the VHTR (Very High Temperature Reactor, an IAEA proposed Generation IV design), the Pebble bed Reactor or the HTTR in all cases they share a number of common characteristics, so I shall group them under the umbrella of High Temperature Gas Reactors (HTGR’s). In principle all of these consist of a graphite moderated reactor core using an inert gas, likely helium, as a cooling fluid. 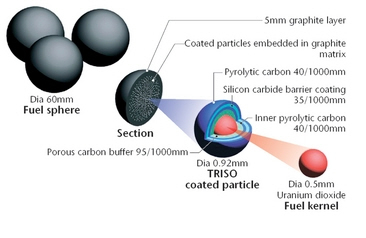 The fuel would be either in the form of roughly 60mm graphite spheres inside of which are suspended a matrix of silicon carbide and Uranium dioxide particles, or stacks of prismatic blocks of a similar composition. By including Thorium dioxide within the fuel mix, we can also part utilise the Thorium fuel cycle. However as Thorium has no naturally occurring fissile isotopes, it must be used in a mixed mode with Uranium. One of the key advantages of HTGR’s is the high operating temperatures, ranging from a minimum of around 650 °C all the way up to 1,000 °C. This has several useful advantages. Firstly, we can now utilise the Brayton cycle, which can potentially allow for thermal efficiencies of up to 65% (although 45-55% is more typical) compared with a maximum of 47% for the more conventional Rankine (with a typical range of 33-40%). Alternatively, if the operating temperature can be maintain well south of 800 °C, we can utilise the Sulfur-Iodine process to manufacture hydrogen directly using heat energy with a high level of energy efficiency. This is an important characteristic, as I’ve pointed out in pervious posts, the vast majority of our energy use is in the form of heat (around 37% for the UK) or transport fuels (36% in UK) as compared to our current obsession, electricity (a mere 20% in the UK, 14% globally). Thus hydrogen is arguably a more useful output from reactors than electricity. As regards safety, HTGR’s represent a very safe reactor design. Unlike in a PWR an LOCA need not be fatal. Its fuel pellet system has a negative temperature co-efficient (i.e nuclear reactions decrease with rising temperature) and its graphite moderator has a very high thermal inertia. Indeed, in one test of German’s AVR HTGR, they actually withdrew all the control rods and turned off the cooling system. The reactor got very hot, radiation levels rose (within the containment vessel) but the reactor held out with no obvious damage reported. While not the sort of thing you’d want to be doing with a HTGR on a regular basis “for a laugh”, this test demonstrates the superiority of its passive safety. This also means, as at Fukushima, we don’t need to be as worried about loss of on site power as is the case with a LWR. It’s still something we would need to be concerned about, but it won’t automatically lead to disaster, giving any operators a lot more wriggle room in an emergency. Also, as Helium is an inert gas we don’t need to worry about issues such as in the case of water cooled reactor, the water breaking down under the action of high heat and creating a hydrogen bubble. This very process occurred in at least 2 of the Fukushima reactors. But again, HGTR’s are immune to such a concern due to the use of an inert gas as a cooling medium. The technology behind HTGR’s has some track record, so while some R&D would be necessary, we wouldn’t be starting off with a blank sheet of paper (as is essentially the case for a number of the other reactors we will later review). The British Dragon reactor (1st critical 1965, original Kernel of current HTGR designs), the Germany’s AVR (Pebble bed design, operated for 21 years, 46 MWth & 15 MWe), THT-300 (Pebble bed, used Thorium cycle, 300 MW capacity), Japan’s HTTR (Prismatic block core, 10 MWth) and the Chinese HTR-10 (similar to the AVR, but 10 MWe output, being used as a design tool for a larger 250 MWth reactors) are a number of examples. Then there’s also the 26 British Magnox reactors and 14 AGR’s both of which used Carbon dioxide as a coolant. Of course, some of these reactors, notably the AGR’s are more relevant in telling us how NOT to build a HTGR than how to build them properly! The British AGR’s were seriously late and vastly over budget. Indeed there are a number of people who would blame them for effectively “killing off” Britain’s indigenous nuclear industry (several comments along those lines can be found in this book here). Also, the German AVR highlighted a number of potential problems with the HTGR design. Fuel temperature instabilities (while the operating temperature was 950 °C at outlet some fuel pebbles hit much higher temperatures than this) led to a higher than expected level of radioactive contamination of the pressure vessel. There were also a number of potential problems with radioactive dust from the fuel which had gradually build up in the core. Finally, it also became clear that part of the reactor’s graphite core had cracked, likely due to the intense heat. The other German reactor, the THT-300 also had an incident in which a fuel pebble got stuck causing very high radioactivity levels and the escape of a small amount of highly radioactive dust into the environment. One could blame both of these as faults of the Pebble bed fuel delivery system than anything necessarily wrong with the HTGR concept. Indeed Dr Moormann, an expert in HTGR’s, highlights a number of problems and issues with Pebble beds here some of which I’ve already mentioned, but also the problem of dust generation by Pebble movement. I would note that Dr Albert Koster, of PBMR (the South African Pebble bed reactor company) rebuts these points here. But clearly we could fix a number of these problems by just abandoning the pebble bed concept and going for a prismatic block fuel arrangement (i.e we fix the fuel in place and refuel/defuel it just like an ordinary reactor). Even so, the difficulties above suggests that the existing HTGR reactor designs sails a little too close to the wind in terms of temperature and it would probably be necessary to alter the choice of materials used in them. But there are other issues as well, notably the danger of water or air ingress into the core both of which present a fire hazard. Indeed it is fire that is very much my concern as regards these reactors. That big graphite core is a serious worry, it is listed as one of the concerns here regarding PBMR’s. As one nuclear physics quipped “graphite is basically just high grade coal”. Obviously enough, building a nuclear reactor core out of coal doesn’t sound like a sensible idea! Its worth remembering that part of what made Chernobyl the disaster that it was, and why Fukushima is likely to have a much smaller level of fallout (despite 4 reactors involved, one fuelled with MOX against a single reactor fuelled with only lightly enriched uranium) is because the graphite moderated core at Chernobyl caught fire. It was this fire and the smoke it generated that allowed the radioactive material from the core to spread over such a large area. There is some dispute within nuclear energy circles as to how significant the risk of fire is to graphite cored reactors. The evidence from Chernobyl suggests that it did, as the NEA official accident report (10 years on) discusses. Analysis of the fission products from the Chernobyl reactor (and the Windscale) accident suggests some combustion of graphite occurred in both cases. Dr Moormann suggests that such concerns should be applied to a HTGR too, especially if the core is breached in some way by a large impact (Earthquake or a suicide attack with a jet airliner). This impact issue was recently a cause for concern regarding assessments of the safety of the UK’s AGR reactors. Dr Moormann also brings up the risk of water ingress (mentioned earlier) which could cause a temporary flip in the reactors void co-efficient from negative to positive. Moir and Teller (2004, yes that Teller) also bring up the matter of fire risk (briefly!) and it is mentioned back in a 1982 ed of the New Scientist. However, on the other hand we have a recent report from the Windscale decommissioning team suggest tha no fire occurred and that damage to the core was localised to the region around fuel assemblies. Also Richards et al (1985) suggests that pure “nuclear” grade graphite is very difficult to set alight. General atomics, promoters of the GT-MHR reactor (a prismatic block type HTGR) say that graphite fires are of little concern. However I would note that in the above case the MHR has a layer of SiC to protect the graphite (Penner et al, 2007) and it is built underground (which limits our concerns regarding “large impacts” although as will be discussed in chapter 10.2.2 it opens up other problems). Weighing up all the above evidence suggests, that the graphite fire risk is probably not as bad as it was long understood to be. However, we cannot conclusively conclude that there is no fire risk (as some mistakenly do), particularly given the evidence from Chernobyl. Indeed the precautionary principle would require that we assume that there is a fire risk, until it can be conclusively be proved otherwise. So clearly any FMEA process would zero in on this as a major issue that needs tackling. We need to take care in our design to make sure that any potential fire can be safely contained. How far the regulating authorities (and the general public) would require us to go is difficult to say, but we’ll now speculate on a few measures. Obviously the above means that any ideas we have about building HTGR’s without containment domes, as some supporters of these reactors suggest we can (and indeed the UK’s AGR’s and Magnox reactors were also built without containment domes), wouldn’t be a good idea. I should note that the containment dome over a HTGR wouldn’t need to be build to the same exacting standards as one over a LWR as our goal is to contain a fire, not a melting down reactor core. This is important as it’s largely been the delays and difficulties in pouring concrete for these cores that is responsible for the messy cost overruns on the various new LWR reactor projects that are ongoing. Designing this containment dome to withstand some form of aircraft impact might also prove to be a requirement. Unfortunately, that would likely be expensive. Our HTGR’s containment dome would need to be fitted out with some form of automatic fire detection and suppression system, specifically one that can cope with a high temperature graphite fire. As the Windscale power plant fire showed proper planning and equipment would be essential. At Windscale the initially attempt to put out the fire using CO2 failed, as the high temperatures of the fire simply stripped the oxygen from the CO2. The operators finally gambled and poured in water, knowing that this risked setting off an explosion, which fortunately didn’t happen. So clearly we’d need to be better prepared, an inert gas (Nitrogen, Argon or Xenon) or Halon gas could do the trick, if we have enough of it on site. I would note that a number of Halon’s have some potentially nasty environmental issues, such as being known carcinogens and mucking up the ozone layer, so inevitably storing a large quantity of them on site (never mind using them!) would have some serious environmental implications.I would note that the German HTG plants had connectors attached to the outside of the containment building (Kroger et al 1989) compatible with fire hose connectors, to allow fluid drain (in the event of a water ingress scenario) or the flooding of the core with water (as with Windscale, risky but a last ditch resort measure) to put out the fire. And while talking about fire brigades, we don’t want to be relying, as at Chernobyl, on the local fire crew showing up and doing a Matrosov. Having a dedicated on-site fire crew covering the plant at all times (or nearby covering several plants in a geographical area), as is standard practice for airports, would be sensible. This fire crew, would be specifically trained in dealing with a high temperature graphite fire and be properly equipped to tackle such an event (i.e have working radiation suits! Unlike the situation at Chernobyl). Post-Fukushima the authorities seem to have recognised the risks fire posses to nuclear power plants (graphite cored otherwise) and there is talk about requiring just such dedicated fire crews at the plants. Another option being considered is to have some sort of dedicated global “Thunderbirds” team (see here) which will fly in robots from worldwide to a plant to put out the fire. I suspect the fire crew option will re-emerge thought once the practicalities of this are brought up, but watch this space. These measures outlined about should ultimately close off this “fire risk” loop hole, both for HTGR’s and other graphite cored reactors. However, how many of these measures would be necessary and how much it would cost is difficult to assess at this time. Another problem for HTGR’s is size. The fuel in question, whether pebbles or prismatic blocks, is much less dense (in energy terms) than existing fuel arrangements in reactors. Hence the core needs to be bigger for a relatively similar power output. Worse still, because gases have a much lower heat capacity and density than water (or any liquid for that matter) the size of the core needs to be substantially larger if we are to supply a similar area for heat removal. For example the French N4 (PWR) has a diameter of just 5.5m, while a British AGR (Gas cooled) with a similar capacity is 30m in diameter. This is a particular problem given what was said earlier about materials. Building large pressure vessels out of exotic and super-expensive alloys is going to be pricy. So there would be good reason to try and keep these reactors small, I suspect 250MWth (as the Chinese seem to be banking on) is about as large as you’d want to build these things. This means we lose the possibility of economies of scale, thought as I’ll point out later it’s a worthwhile trade off. The choice of materials also has implications for the HTGR design. Going for a design with a very high operating temperature, which would be anything over 800 °C would greatly restrict our material choices. We could immediately rule out using any form of stainless steel alloy, restricting us to using either the Nickel “super-alloys” discussed or similar (but typically more expensive) Titanium alloy’s might just about be up to the job. If they proved inadequate then it would be a grim choice between Refractory metals or ceramics. While there is much experience in building pressure vessels out of concrete for this reactor design type (the AVR, AGR’s and the THT-300), I would be somewhat against it, given that the bulk of that experience has shown that it creates construction problems (i.e slows down construction, can lead to cost escalations) and safety issues (cracking and brittle fracture). However, the alternatives to concrete, given that we’ve simply never made anything that big out of any form of Superalloy, would require further research – the cost of which again must be charged against the R&D plus eventual installation costs of all HTGR’s. 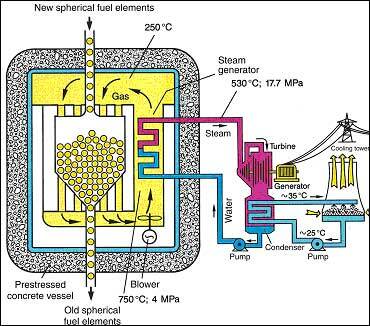 And we certainly can’t make certain critical components in these reactors out of concrete (or any other refractory) such as the turbine set or the circulation pumps, etc. These will have to be made out of those aforementioned super-alloys, which will likely prove expensive. There is of course a simple solution here – lower the operating temperature of the reactor. This puts the temperature of our core, or at the very least our turbine set (which will be a few hundred degrees lower, plus we don’t need to worry about neutron fluxes here) within the range of temperatures where we can utilise high temperature stainless steel alloys. It seems the Chinese have opted to do this with their proposed HTGR which will have an operating temperature of just 750 °C. They also seem to have opted to stick with Uranium fuel for the moment, rather than Thorium, which seems sensible. But of course lowering our operating temperature means ditching our plans to make hydrogen directly via the Sulfur-Iodine process as well as accepting a lower thermal efficiency. The choice of working fluid in our turbine kit also has implications, as discussed earlier. I would note that using water in the secondary circuit of a HTGR need not endanger safety, so long as the primary circuit (the one flowing through the reactor) used an inert gas and appropriate measures are taken to prevent leaks. One final issue is that of decommissioning. Gas reactors have proven much more expensive to decommission as compared to light water reactors (see here, final paragraph), thought given that we’ve yet to fully decommission a large LWR it’s difficult to judge whether this is such a disadvantage. Either way, there have been problems with Gas reactors (again see AVR for a run down of some of them), a lot of them relating to that large graphite moderator in the core (again is it absolutely essential? Can they be redesigned to incorporate an alternative moderator?). Indeed the pie-chart above, for Scotland (the overall UK figures would be a bit different as they contain more of the fuel and reprocessing wastes from Selafield), you will notice how Graphite from AGR’s makes up 45% of Scotland’s nuclear waste inventory. So the current doctrine would imply that HTGR’s would be more expensive to decommission and may well produce much more ILW (and quite possibly HLW too, but the jury’s still out on that one) than existing LWR’s. Weight all that I’ve said up, there is some merit in the HTGR design. It would produce a reactor that is much safer than the LWR reactors. This is important, as a major show stopper as far as nuclear roll out in many countries is the issue of safety. The HTGR’s ability to utilise the Thorium cycle (at least partially anyway, so as long as we retained stocks of fissile material!) would be advantageous, as would there ability to use the Baryton cycle and Sulfur-Iodine process, although the latter is unlikely given the high material requirements. Higher thermal efficiency should lead to less HLW nuclear waste, thought on a volume basis (prismatic block or pebble) the spend fuel output would be much larger. 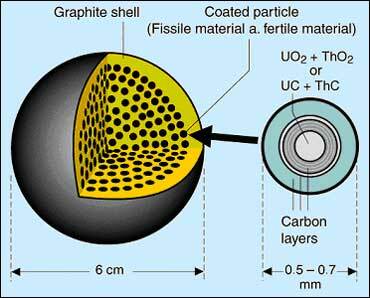 It should be noted thought that final storage for other fuel assemblies requires them to be encapsulated in iron. But even so, once we factor in the increased waste from decommissioning the plants, we’d have to give the HTGR’s a failing grade on this one. HTGR’s are scaleable and indeed would most likely work better as a small reactor than the “Megatrons”. I will discuss this issue further when talking about small modular reactors later. The other major black mark against the HTGR concept (aside from a higher waste footprint) is the issue of cost. All the indicators seem to point to a reactor that is much more expensive to build, operate and decommission than LWR’s. This in itself isn’t a killer blow, we got into our current energy mess by letting the “magic of the market” decide everything and the markets went for the lowest common denominator – imported coal and oil. Indeed, with nuclear power we made the same mistake by going for LWR’s as they appeared to be cheaper. So long as the costs of HTGR’s did not prove to be absurdly higher than those for LWR’s then there would still be a case for them as an alternative. However, its unlikely that HTGR’s could be ever built and decommissioned cheaper than emerging renewable technologies, which as I noted in a prior post, are already cheaper than nuclear energy. The pace of installation of HTGR’s would also likely be slower than LWR’s which are again being built slower than renewables. These factors would restrict our use of HTGR’s to a relatively narrow wedge of energy production. So if ones goal is lots of cheap energy, HTGR’s are unlikely to be able to supply it. 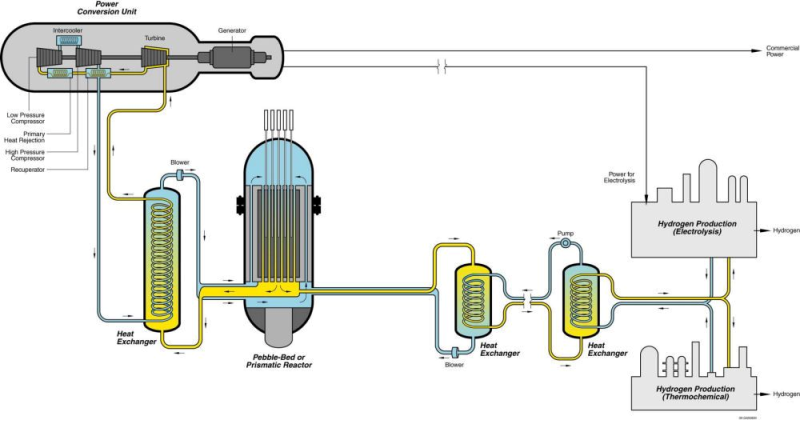 Related developments to the HTGR are the Gas cooled Fast Reactor (GFR) or the Molten Salt Reactor (MSR) which we will now review.